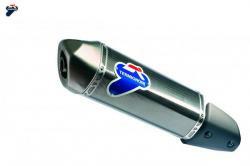 Latest collection of Termignoni Silencers for all Aprilia Motorcycles. The Termignoni homologated exhaust for the Aprilia SR MAX 125 and 300 models comes from the innovation of our R&D Department. Produced using selected and high quality materials, the Termignoni scooter muffler structure is able to offer a light and agile guide. The weight reduction of the exhaust system improves the performance of the bike and makes it more reactive. Particular attention is paid to the design, the Relevance line and steel processing for a “carbon look” effect. The muffler designed for Aprilia is universal and also compatible with other Piaggio, Gilera and Derbi motorcycle models.